Because granite does not needsupport to prevent cracking or splitting, Standard Foundations serve as ground stabilizers for thememorial. They are not designed to support the marker or monument like a housefoundation supports the structure. When setting the memorial, our setting crewwill dig out the area where the monument will be placed and pour cement intothe area. The memorial will then be placed on top of the cement, to hold it inplace and give it some stability. Our optional concrete pad system is alsoavailable for our memorials. In order to address the problem of groundmovement, we have devised a method to improve the stabilization ability of ourfoundations by using a sub-foundation consisting of 12 inch concrete pilingsand a 4 inch packed sand buffer. 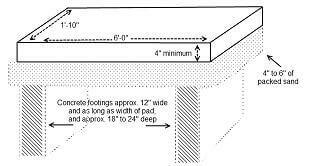 A manufactured concrete pad will then rest ontop of the sand buffer. The sand buffer acts as a cushion to help support themonument as the ground moves. Normally, our manufactured pads will beapproximately 1 inch above ground and 8 to 12 inches longer and wider than themonument. Adjustments will be made when working in an uneven area.